I started the month with Power Clutch. 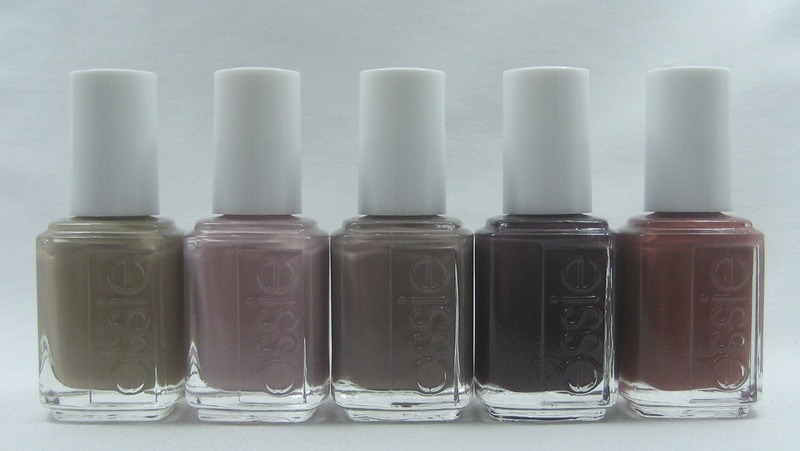 At the time, it was the only one I'd bought from the Essie Fall 2011 collection. Over the course of the month, I got all the other colors. Below, left to right: Case Study, Lady Like, Glamour Purse, Carry On, Very Structured. I didn't get around to swatching any of them, much less doing comparisons, so finally decided to just wear them all at once! I put Case Study on my index finger, Glamour Purse on my ring, and Lady Like on the rest, then added dots in Carry On and Very Structured. You'll see that my dotting tool technique still needs some work, but this was fun to do and fun to look at. I'm not sure that Essie would approve—but then again, she does bust out the glitter every now and then, so she's not all understated all the time. In other news, I decided to do another impromptu giveaway, so I fired up random.org and chose a number corresponding to a comment on my Piú Mosso entry to win an extra bottle of that deep shimmery beauty (which I ordered to get the free shipping with $100 purchase). Congratulations to Aly of Mai Senza Smalto! If you haven't already checked out her blog, I encourage you to do so—she does great swatches (and takes the time to write in two languages so mono-linguals like me don't have to mess with Google Translate). In other other news, I finally found Wet 'n' Wild On the Prowl today, when I stretched my lunch hour to fit in a couple CVS stores I don't get to very often. The good news is most of the colors were there. The bad news is the one that was missing is the one I was most wanting to try: Tangled in My Web (black glitter in a clear base). 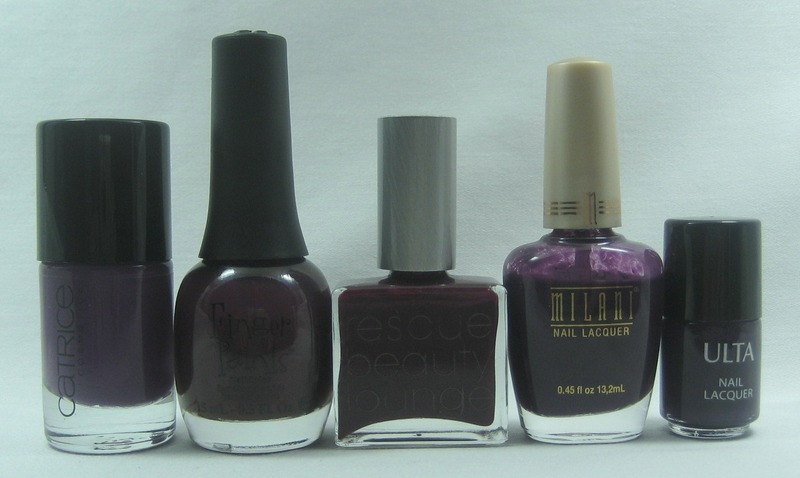 The ones I did see: Buy Me a Drink (wine shimmer), Ink Well (black creme), Correction Tape (multi glitter in a clear base), Behind Closed Doors (red glitter in black base), Cougar Attack (copper glitter in black base), Jungle Fever (green shimmer), and Ready to Pounce (deep purple shimmer). The the other CVS I went to at lunch didn't have On the Prowl, but they did have several bottles of Confetti Tiara, which is great for frankening and usually out of stock (I've heard that it's being discontinued but so far I've yet to see any CVS that's switched over the display, there's just almost always an empty spot where Tiara belongs). I'm considering whether to take a different route home from work tonight so I can hit up a few more CVS stores outside of my normal hunting grounds or just wait to see if it shows up at my usual stores at some point. The CVS stores closest to my house have been very late to get the last two Wet 'n' Wild special collections, so I'm thinking this one might be the same way. I've slipped a few Halloween ones into my recent display entries, but today I've got plenty more. Still no Wet 'n' Wild On the Prowl, though--do they not understand I need my glitters?! You may remember the $4.99 Sinful crack from my last display entry. I've since seen another display with the crack in it; this one also had three shades of nail polish to wear under the crack. I didn't even pick them up to see what shades they were; I'm guessing they're core. 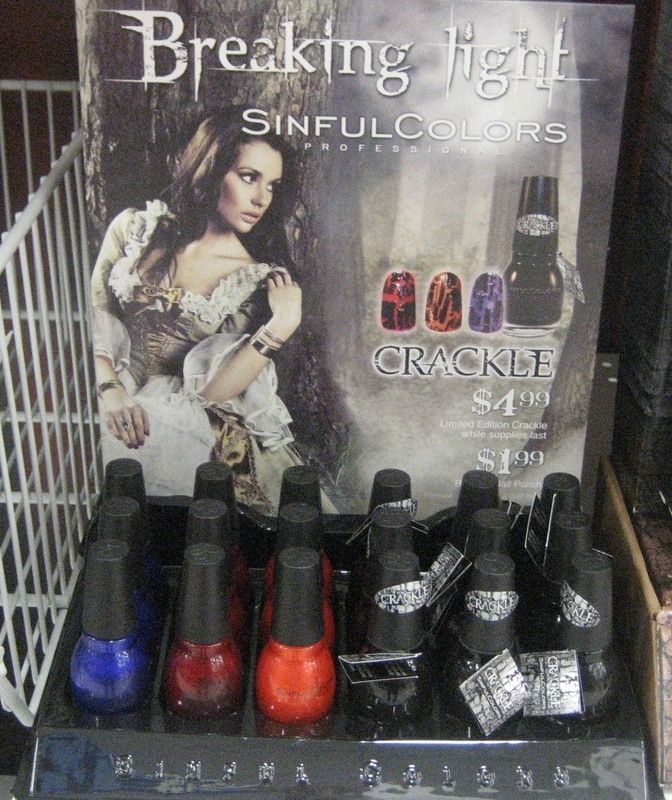 This display is called Breaking Light; I'm assuming that's an attempt to tie into the upcoming Breaking Dawn movie in the Twilight saga in a way that won't get them sued. 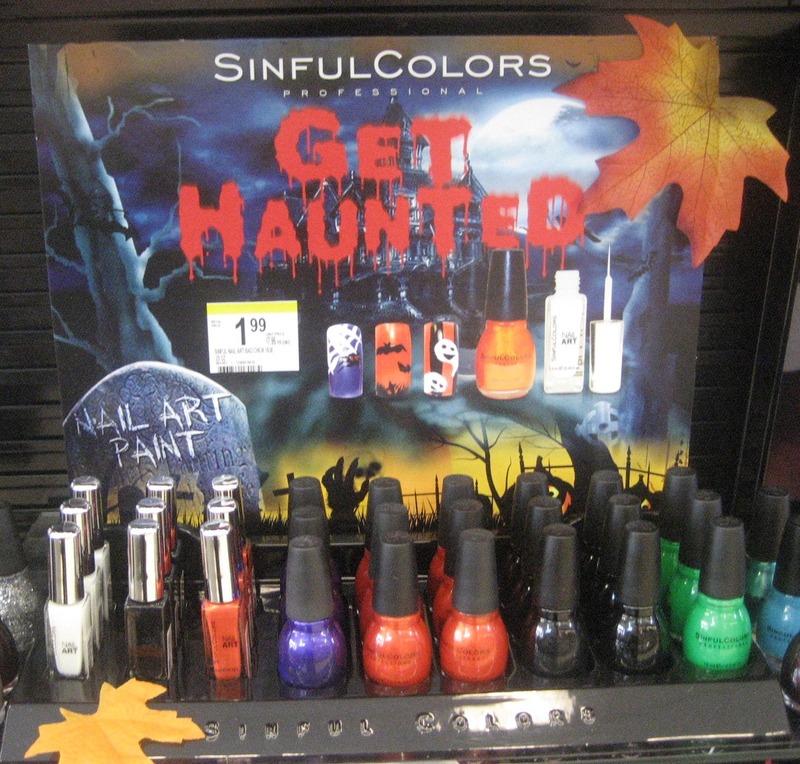 Sinful has also put out a Get Haunted display with nail art paint and nail polish (the Walgreens where I saw this had added some seasonal decorations of their own). Again, I think these are all core colors. I think Sinful is going to have to call a collection "All New Never Before Released" in order to get me to do more than take a picture and move on. 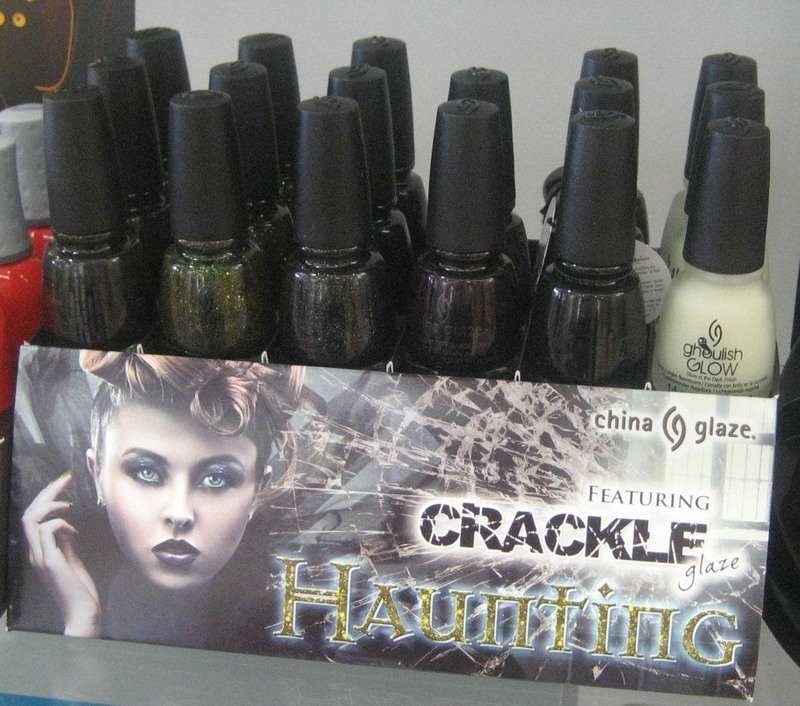 Ulta had the China Glaze Haunting collection, which consists of Near Dark (very deep olive green creme), It's Alive (olive green glitter), Haunting (black with silver glitter), Crimson (very dark red creme), Black Mesh (black crack re-release), and Ghoulish Glow (glow in the dark). Just to the left of this display you might see a tiny bit of the Orly Halloween display, which I am not including because it looked like the very same one as last year, with no new colors. 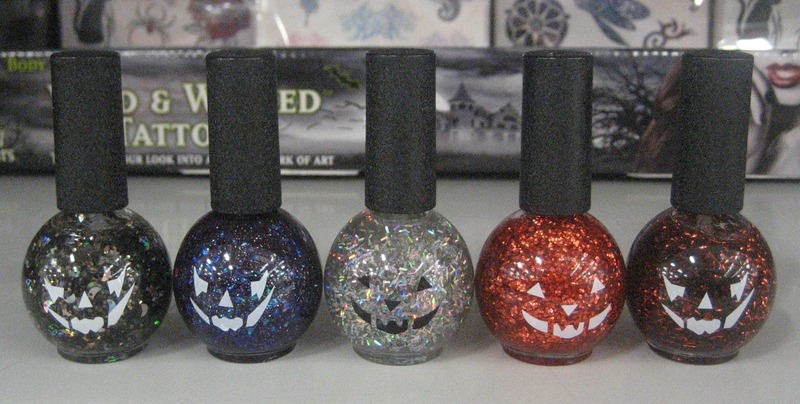 Meijer is a wonderland of Halloween polish. 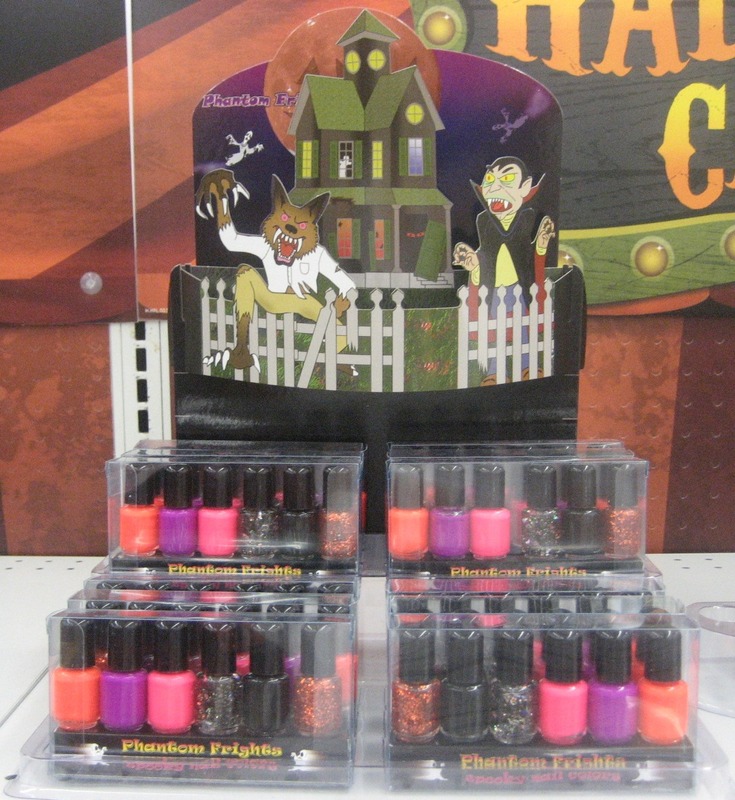 Let's start with the Fright Night Claw Polish in the coffin-shaped bottles (I've also seen these CVS this year). 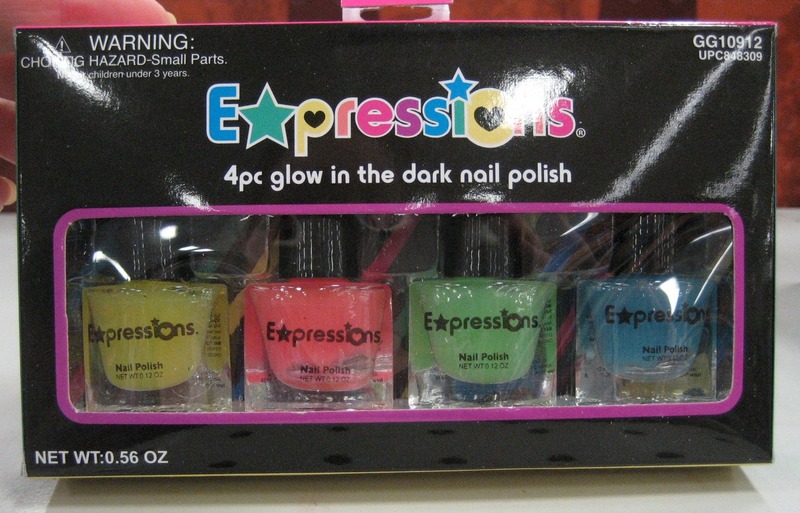 The display has six slots, but I've seen seven different colors of polish so far in different Meijer stores. 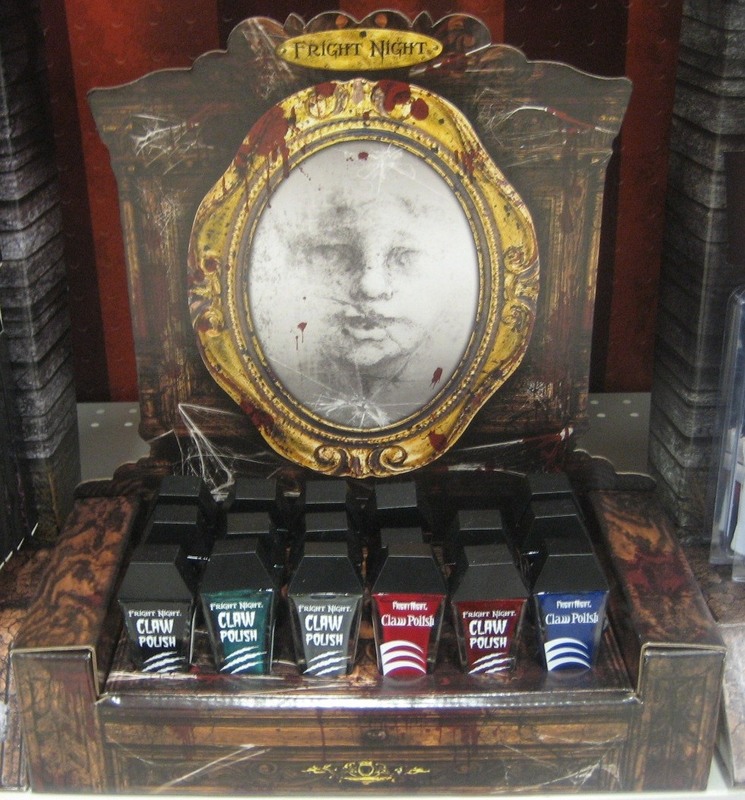 The display below has Sinister (black creme), Toxic (green shimmer), Phantom (grey shimmer), Bloodshed (red creme), Voodoo (red glitter), and a blue shimmer that had no name on any of the bottles I picked up, but I've also seen Poison (purple shimmer). I might have to brave a trip to Wal Mart to see what they have this year, as last year they had an orange creme and an orange/black bar glitter in these bottles. 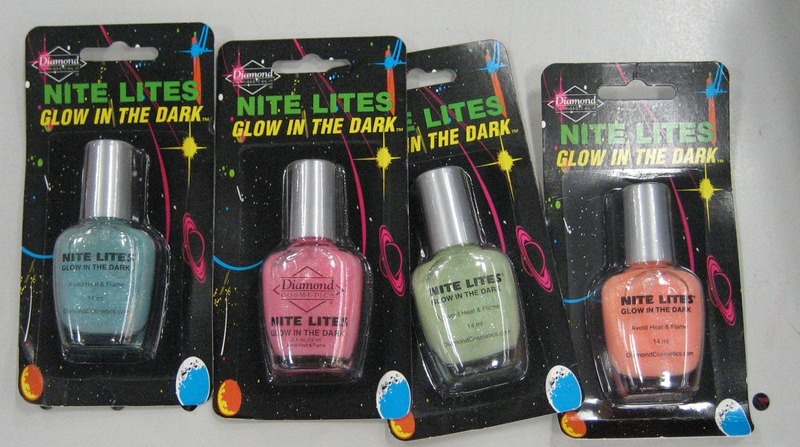 They also have individual bottles of Nite Lites glow in the dark glitter polishes from Diamond Cosmetics, nicely sealed so people can't sample them. I found four colors of these; they look to be the same ones as last year, but some of these bottles have a prominent Diamond Cosmetics logo on them, which is new. 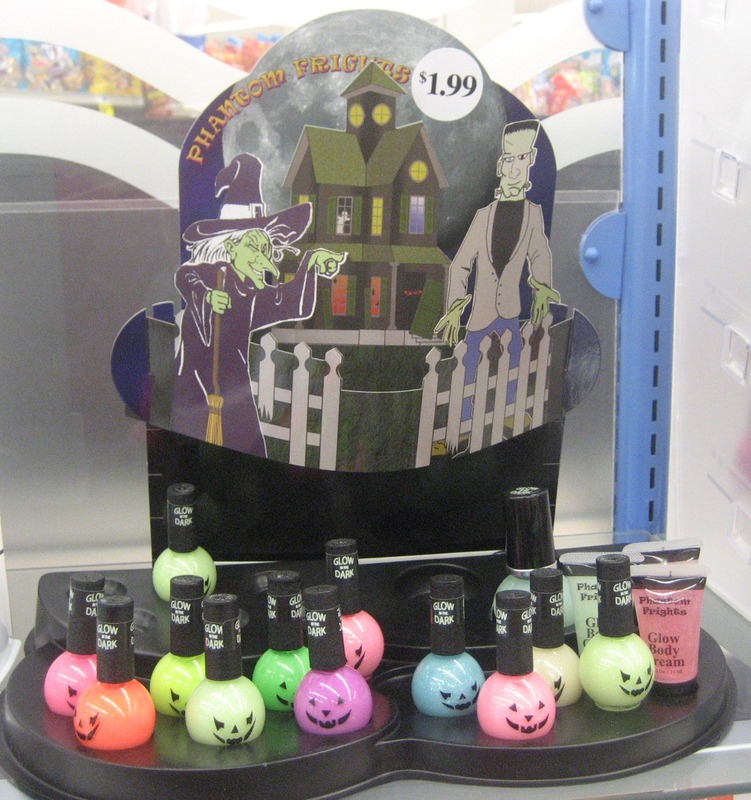 Still at Meijer, there are sets of six mini polishes labelled "Phantom Frights", with bright cremes in orange, purple, and pink, a glitter with cresent moons and circles floating in a dark base, a black creme, and an orange glitter. 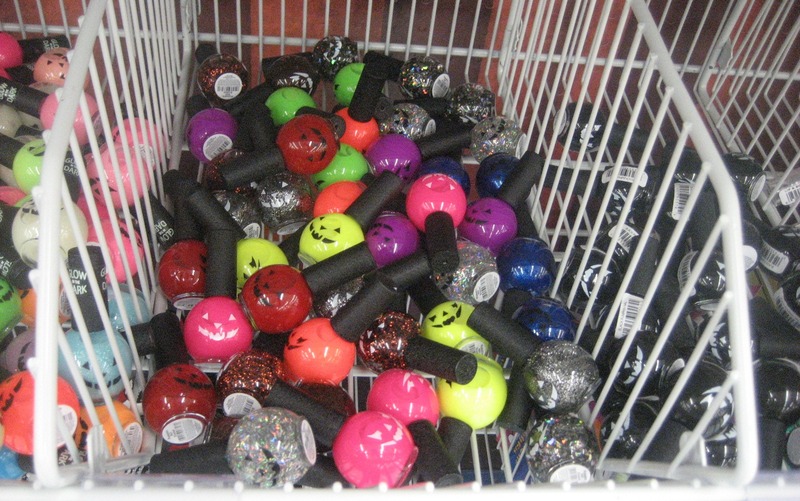 But the big draw at Meijer is the pumkin polishes. Last year, my store had them nicely lined up on shelves; this year, they've put them in mosh pits like they did with the snowmen last Christmas. 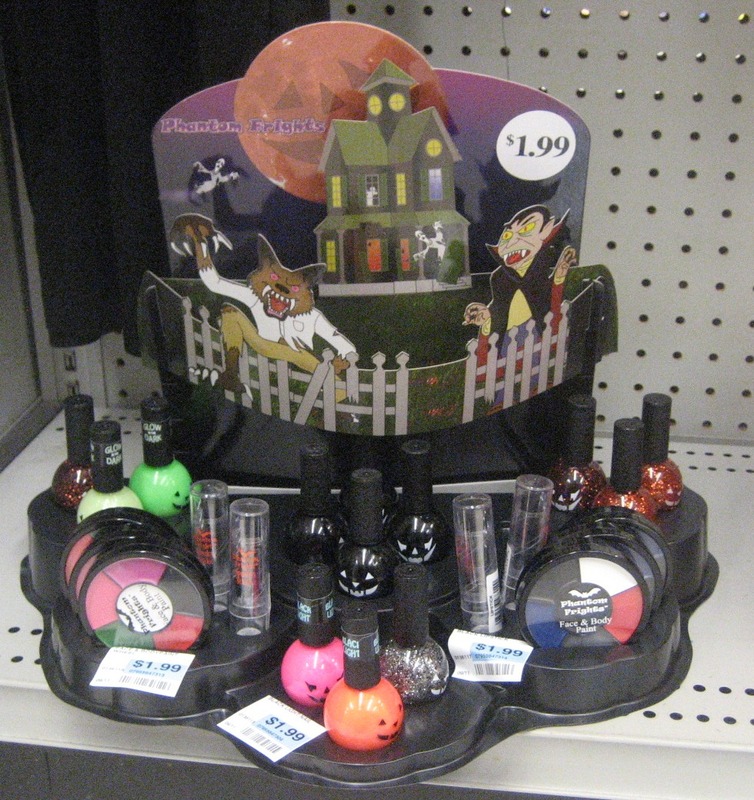 Rite Aid has pumpkins, too, in displays with other Halloween cosmetics. 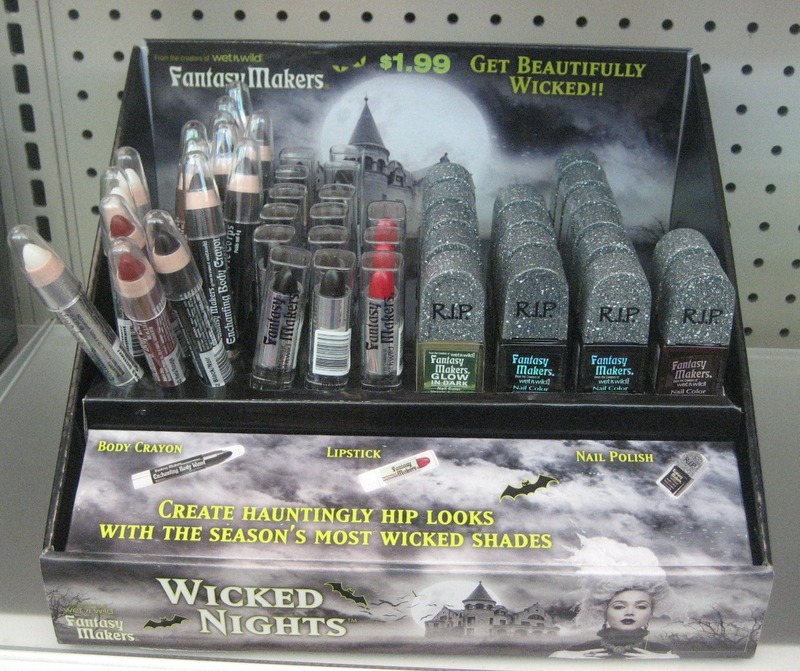 Sometimes they put these in the makeup section of the store; sometimes they put them in the seasonal aisle. Early this month, I shared the Fantasy Makers R.I.P. display at Ulta which had the dud black creme versions of Black Magic; I did find the same display at Meijer with the glitter version. I also found a smaller R.I.P. 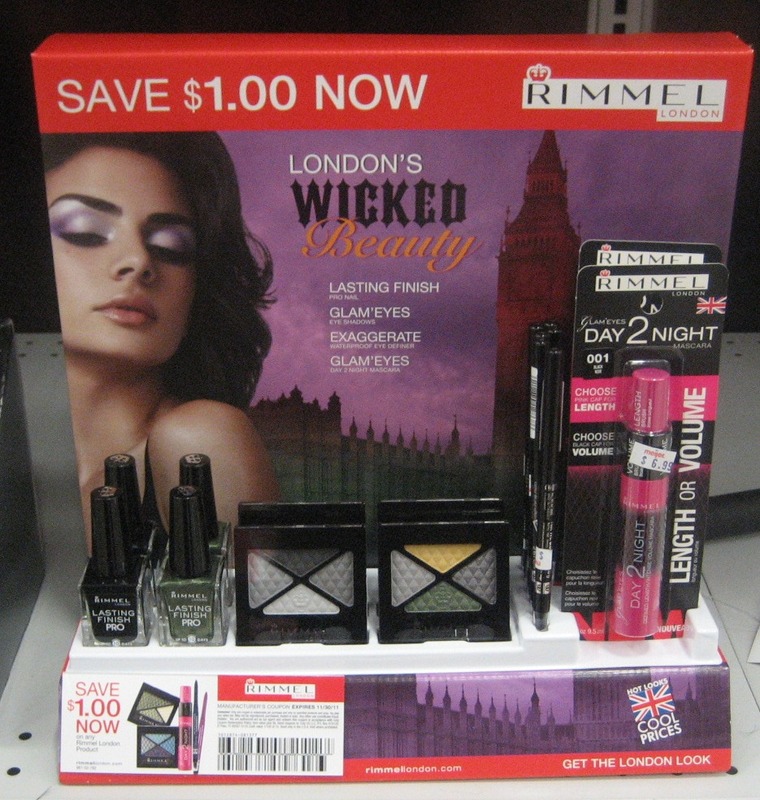 display at CVS with cosmetics and polishes; the polish shades in this one are Night Glow (glow in the dark), Vamp Red (very dark red creme), Black Pearl (not, as you might expect, a shimmer, but instead a black creme), and Purple Potion (black with purple glitter). I am really, really hoping that posting this will cause On the Prowl to come out of hiding. How can I learn to love black glitter if I can't find it to buy? Welcome once again to Nail Wheel Wednesday, also known as "Hi, I'm a Crazy Person". 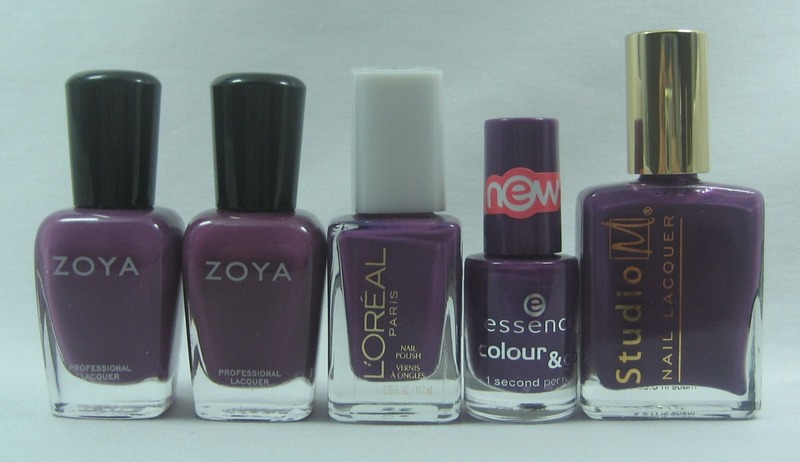 Today I've got purple cremes: lilacs and plums and vampies and such. 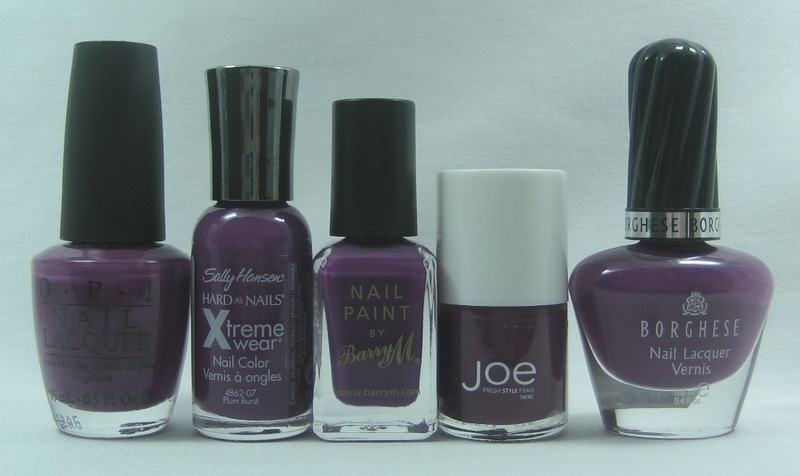 I think a mauve or two might have snuck in as well. This isn't even all my purple cremes: you may remember wheels C2 and D2, and before them A2 and B2, and before them wheel F (which I really need to re-photograph now that I've gotten better at using my camera), and even farther back, the first episode of this series, wheel A. Purple is my favorite color, but even I can see this is excessive. If I win the lottery (I suppose I need to start playing as a first step), I will have to hire a dupe-documenting assistant to help me weed out my stash. In addition to the dupe-documenting assistant; I need to hire someone to follow me around the store saying "no, you have one just like that already". 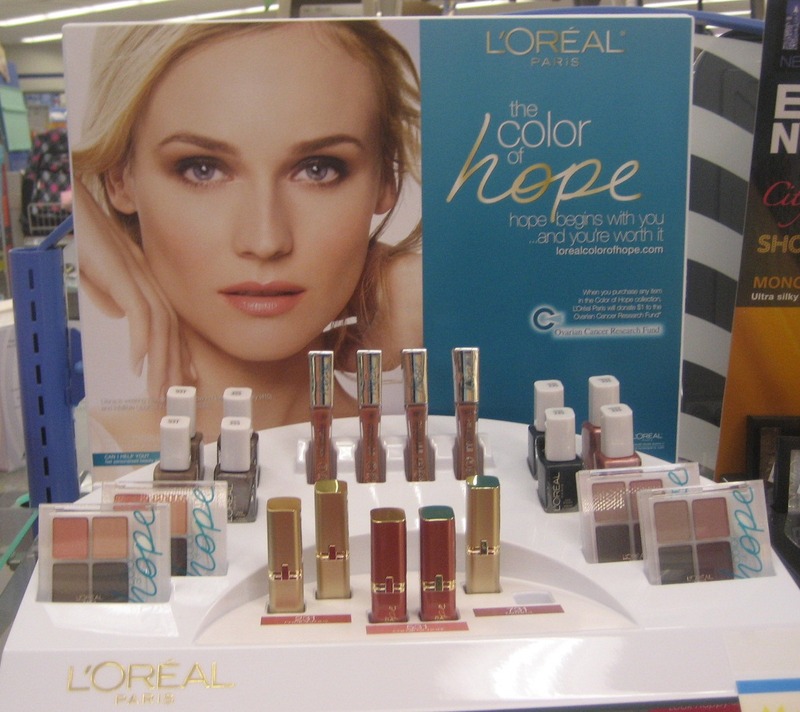 The first time I saw a L'Oreal Color of Hope 2011 display, it was at Walgreens and had no nail polish at all (not even slots for it). 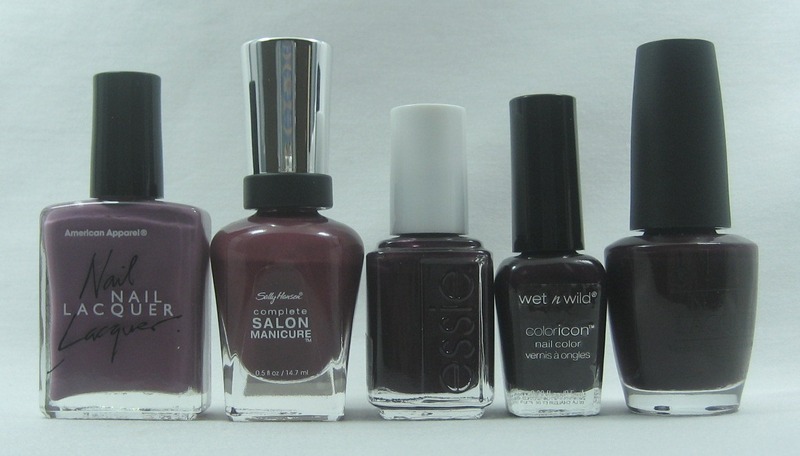 A bit later, I spotted the one with polish at CVS, but one of the four colors was sold out. 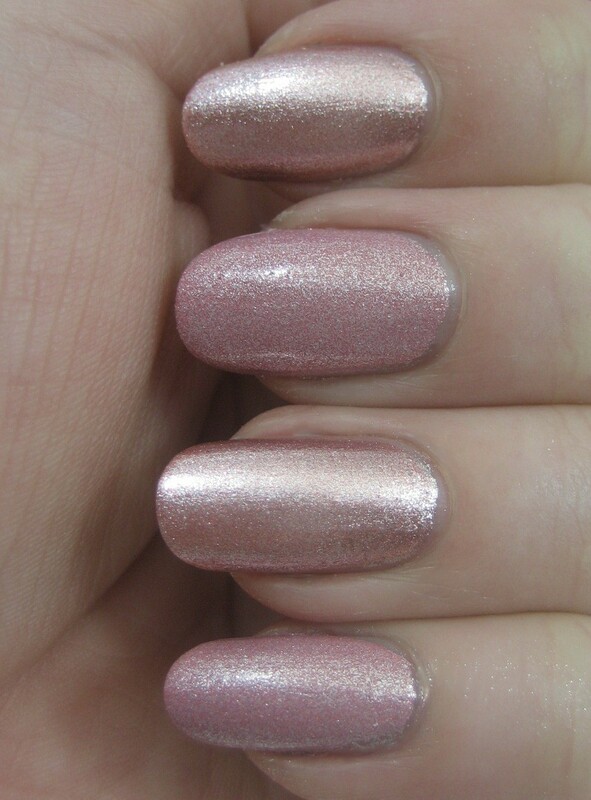 In the display entry where I shared that CVS one, I said the missing color was a peach shimmer (a statement which I think I based on seeing a bottle shot somewhere). I recently came across a full display at Rite Aid, and Whimsical looked more interesting than just another peach shimmer. 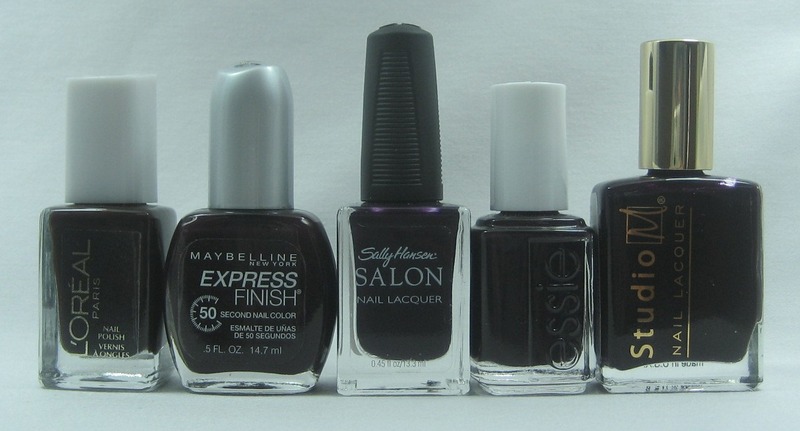 In the fluorescent store lighting, it looked sort of coppery (it's the one on the far right, in the back behind the eyeshadows). 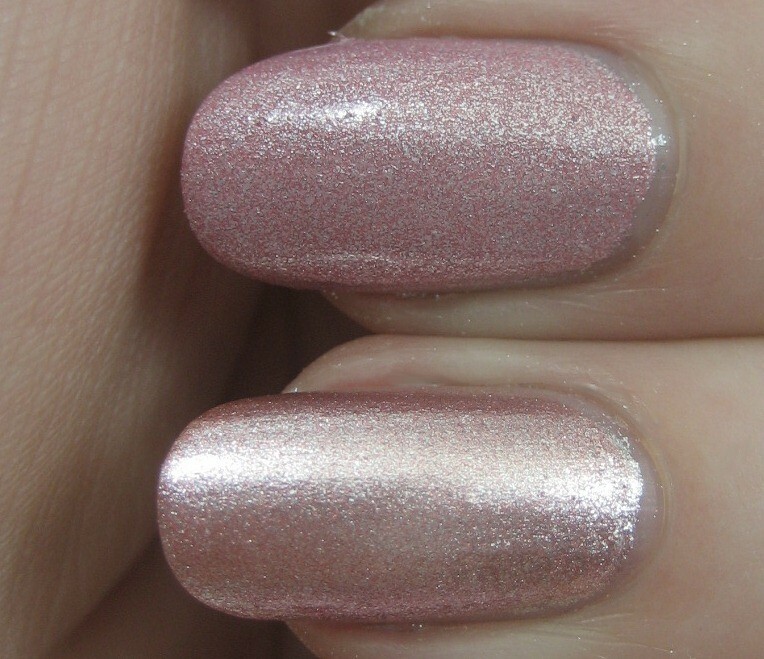 Of course I had to buy a bottle, and when I got it home and on my nails, I found it wasn't really a shimmer but more of a foil and the color was a lot more pink-toned than I expected. It was nearly mannequin hands-y on my skintone—flashy mannequin hands, to be sure, but it blended with my coloring a lot more than I thought it would based on seeing the bottle in the store. 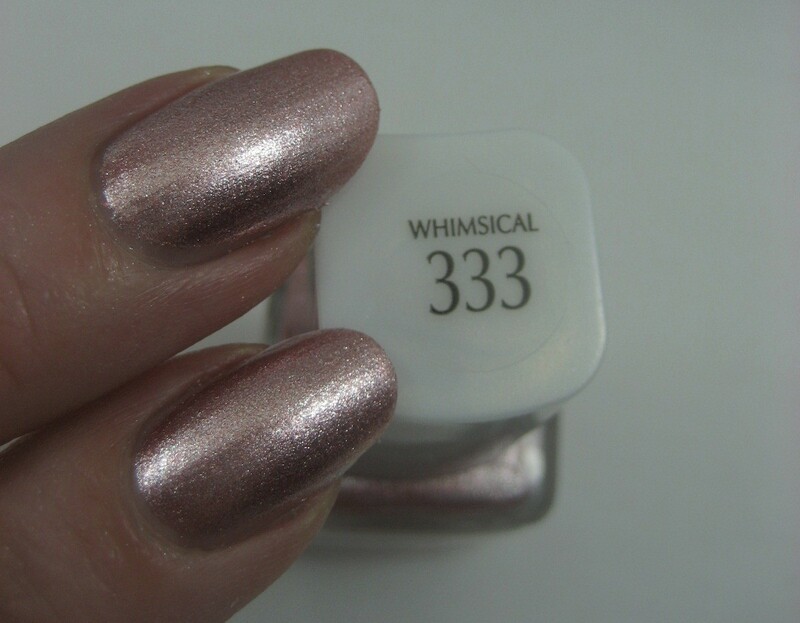 I used three coats of this (no topcoat, as typical for swatches for me) but I might have been able to get away with two. Clean up was a challenge, as tiny flecks of silver got all over my skin and did not want to come off; quite festive, really. 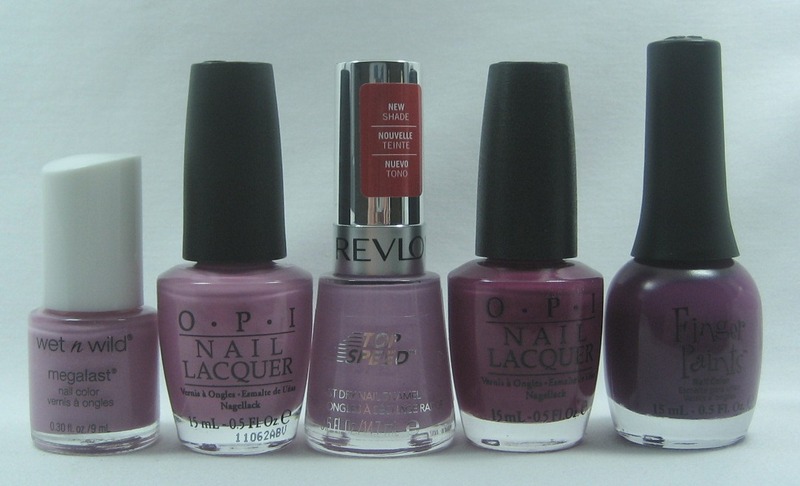 Looking at the Whimisical bottle, it reminded me of another recent acquistion, Revlon Innocent from the Edgy Elegance collection. 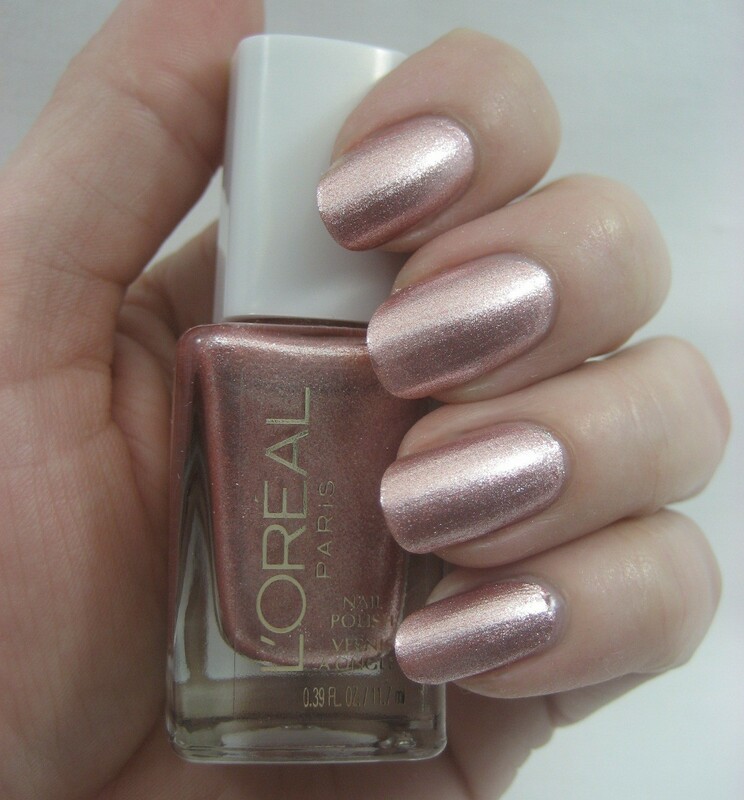 On the nail, the Revlon has more of a rose pink tone compared to the L'Oreal's peachy pink, and it's not as foil-y. 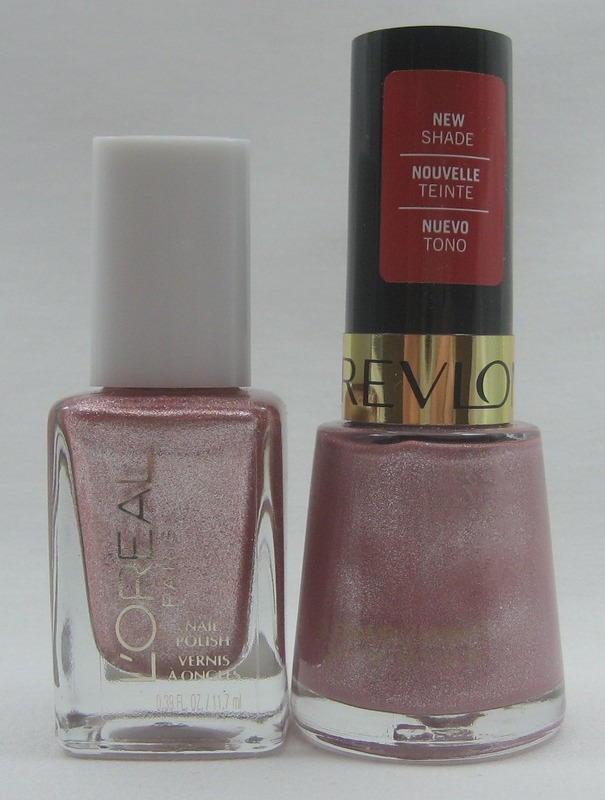 The Revlon has silver flecks in it, same as the L'Oreal, but in the Revlon, they create sort of a speckled look. 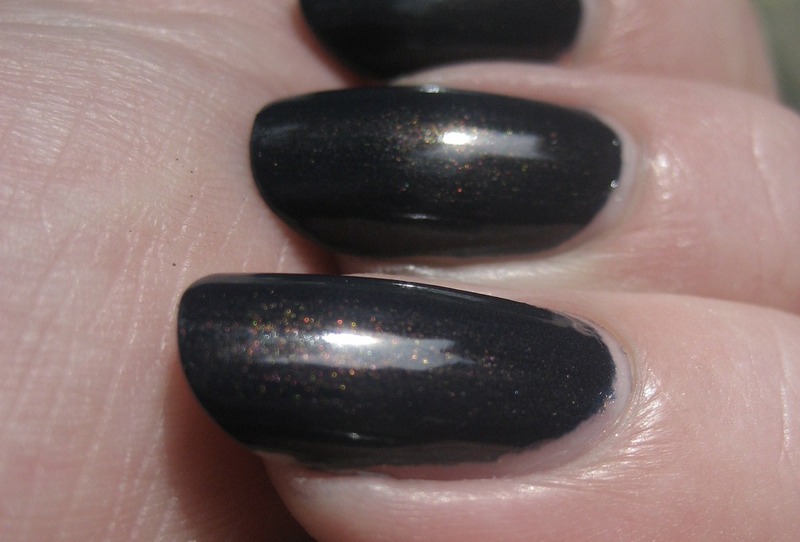 I'm not sure what to call the Revlon's finish: foil shimmer, maybe? Whatever it is, I used two coats of it. Top to bottom: Whimsical, Innocent, Whimsical, Innocent. Top to bottom: Innocent, Whimsical. Neither of these look like fall colors to me, more like spring or even winter, but fall is when they showed up. 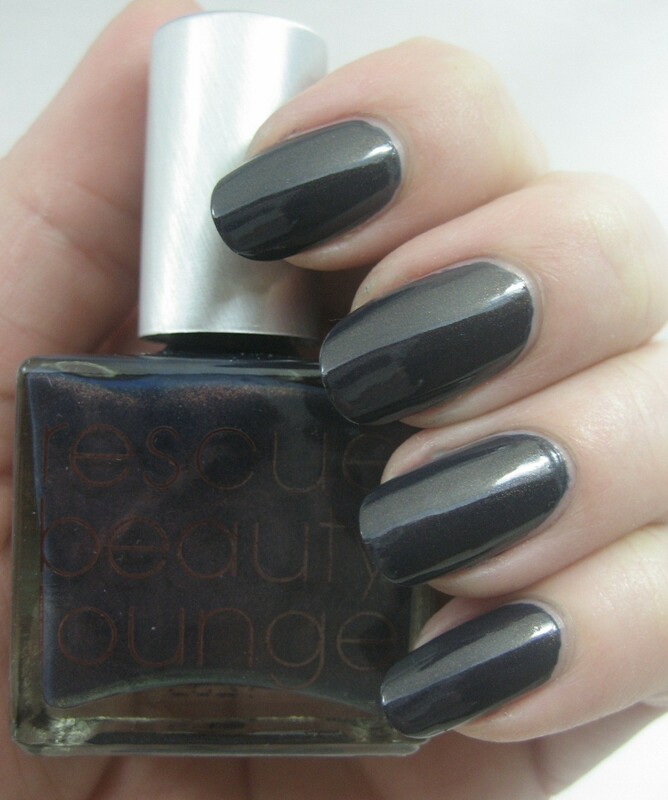 As of a couple years ago, I had no idea what Rescue Beauty Lounge was. 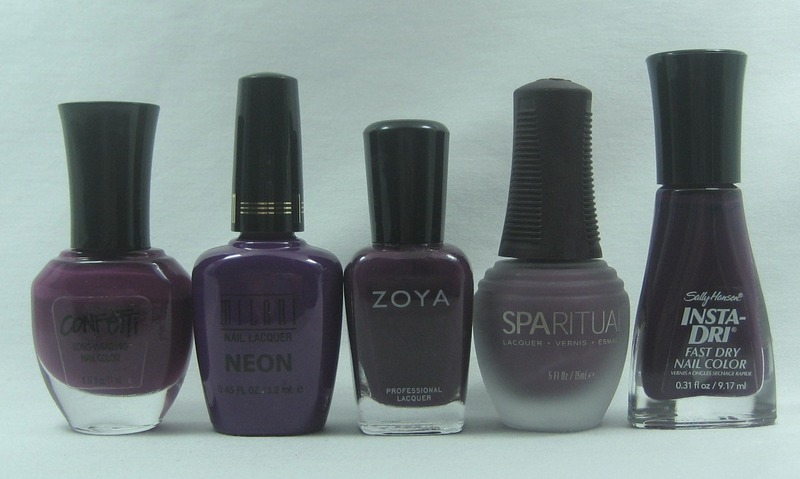 Then I fell in with the nail polish crowd at MakeupAlley and started seeing swatches of these high end polishes, and when there was a 5-hour 50% off sale announced in late 2009, I jumped on that and ordered five colors (Scrangie, Mismas, Orbis Non Sufficit, Stormy, and Teal). Since then, I've collected quite a few RBL colors, but it wasn't until late 2010 that I started pre-ordering entire collections as they came out. Yes, it's expensive, but a) free shipping for orders over $100 and b) if I buy them new when they come out, I don't have to jump through hoops to get them later when I find I regret not buying them. (For those of you who remember my pleading for votes for Locavore in the Bring It Back campaign, I will be ordering that extra to give away as soon as that batch of winners is released in October. Recently I got it in my head that I needed to complete my SpongeBob collection and swapped more than one Lippmann to get the one I was missing, Starfish Patrick.) All of which is a long introduction to why I got today's polish: Piú Mosso from the Firebird Collection, which arrived with its three siblings a while back. I feared this would be one of those dark shimmers that looks like a black creme most of the time, which I find to be rather a waste of my time, but I had to get it anyway. 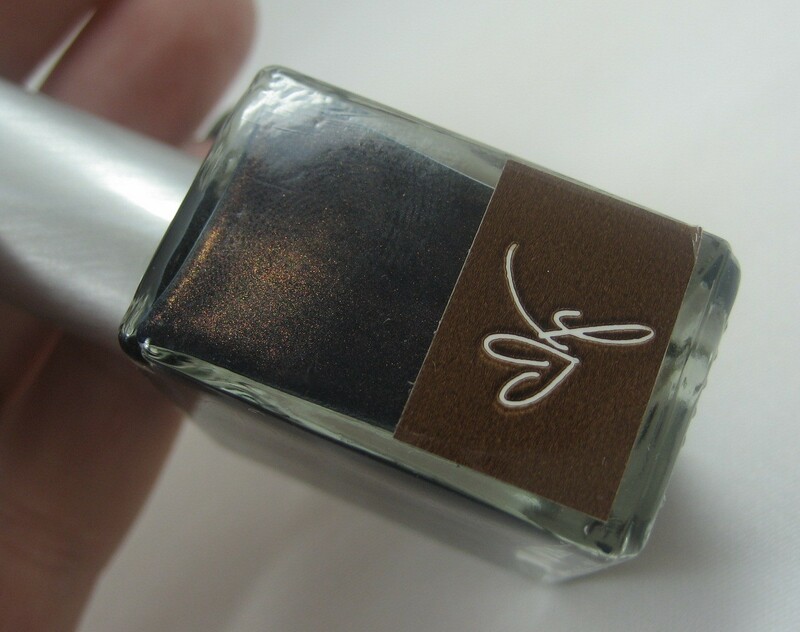 In the bottle, Piú Mosso shows a lot of copper shimmer. The bottle also had a sticker on the side that I don't recall seeing on RBL before; not sure what that's about. 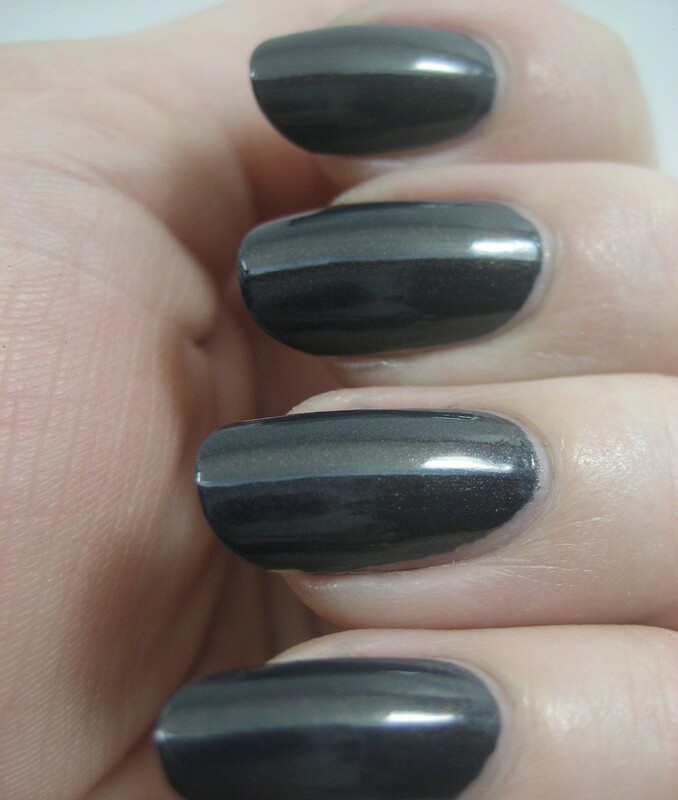 On the nail, most of the shimmer submerges into the blue black base color, but it doesn't disappear entirely even indoors. I used two coats, but could have done only one if I'd been paying attention. In the sun, the shimmer pops, showing copper and gold and pink flashes. I like this one, and think it's modern but not stark. 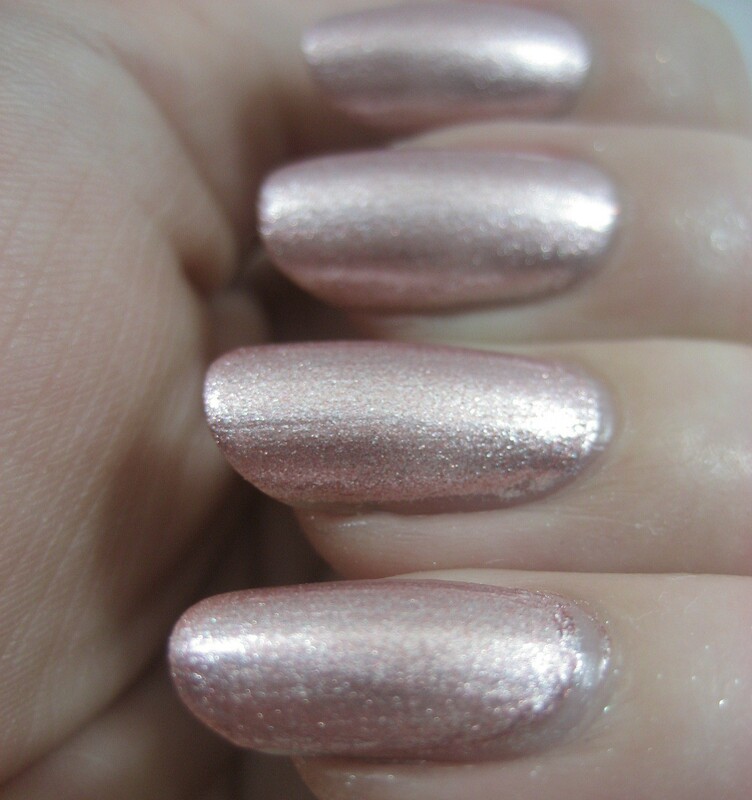 Recent NOTD: Catrice Sir! Yes, Sir!